After a month of 50 game, more than 120 goals and countless emotional and heroic moments, the final of the 2019 Asian Cup has arrived. In the morning, the AFC Disciplinary and Ethics Committee dismissed the protest lodged by the UAE FA over the eligibility of two Qatari players - Bassam Al-Rawi & Almoez Ali. This announcement has released the fog around the complaint that was discussed since the amazing 4-0 victory of the Qataris against the home team - the United Arab Emirates. Zayed Sports City stadium was surprisingly almost full, for the final between Japan and the Middle Eastern representative - Qatar. The Qataris arrived to this phase after tremendous tournament. Qatar managed to succumb 0 losses, 0 goals conceded and scored 16 during their time in the UAE. Will Japan become the best Asian nation with 5 triumphs or Qatar will become the surprising but deserved debutantes? The answer was deep inside Qatar’s Spanish coach - Felix Sanchez Bas - and his players’ pockets. Japan started well, but then after only twelve minutes, the showtime began. Almoez Ali received the ball inside the box with he back to Shuichi Gonda’s goal, but with two keep ups on the left & right feet, he committed an extraordinary bicycle kick, to the right post and in. Qatar went up to 1-0, with Almoez becoming the best goalscorer in a single tournament in the Asian Cup history with 9 goals, surpassing legendary Iranian striker Ali Daei. The assist arrived through the top passer in the tournament - Akram Afif who assisted 10 goals in that point, and all of Almoez’ goals. It didn’t take long and Qatar went up to 2-0. Akram Afif, again as the lead figure in the attack has opened the game in front has passed to Abdulaziz Hatem, who from around 20 meters from goal sent in a beautiful strike to the upper net. Hatem’s second goal of the tournament and Afif’s 11th assist. The stadium was in a complete shock. With zero mistakes and an endless composure, they were watching the best half any Arab team provided in the past years. The second half started in a huge pressure by Japan. The Qatari defensive part has stood well and displayed great stamina and coordination. Then one of the key members in Qatar’s defence, Boualem Khoukhi got injured and left the field, and the confidence of the Annabi went down. Exactly then, in the 69th minute, the Blue Samurais’ pressure brought results - Yuya Osako made havoc near the box, found Takumi Minamino who scored and made it 2-1 from a close range. It was the first goal Qatar conceded in Asian Cup 2019 and the game was on. 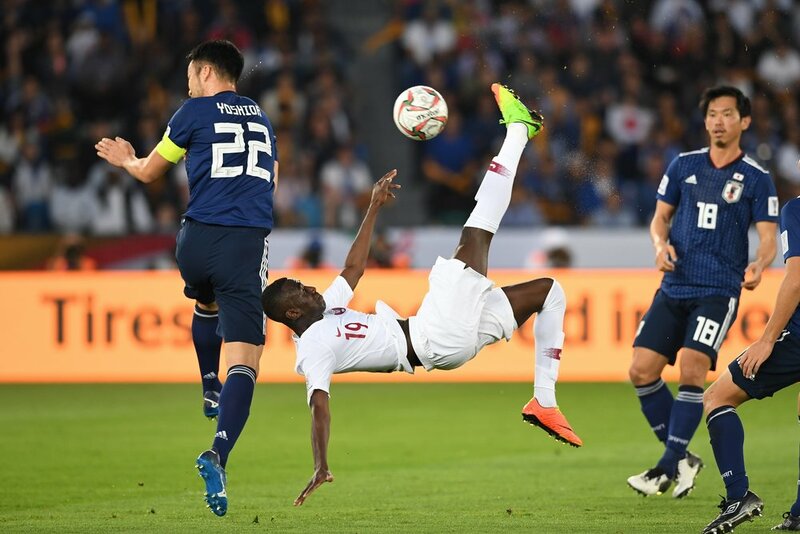 Just before it looked that Japan is coming back, a dramatic moment took place when in a rare attack in the second half Qatar won a corner. Almoez Ali headed the lob straight to Maya Yoshida’s arm within the box, and the Uzbek referee, Ravshan Irmatov used the VAR to decide whether there’s a place for a penalty. He decided there is, showed the yellow to Yoshida and Akram Afif, the prince of Asian football, has converted the spot kick to Qatar’s third goal - 3-1. Against all odds, all the predictions, even before this final Qatar has done the unbelievable, the magical, even the surreal. A team that the whole world likes to be against because of the 2022 World Cup, because of the blockade by its neighbors, because their players’ origins - has kept it quiet and answered on the pitch, with one of the best tournaments a Middle Eastern team has ever done in an Asian Cup. Actually, it was more than that. Qatar is one of the best Middle Eastern sides ever. Maybe even one of the best Asian sides ever. The investment in the Aspire academy was proved right on February 1st, 2019. There’s no other alternative for development and investment in education in football, and this victory & tournament of the Qatari national team has definitely shown it. The Qatari road to World Cup 2022, controversial by so many, has got a huge boost in this Asian Cup, with a serious mark of a very strong Middle Eastern national team already, to host the tournament in less than four years.